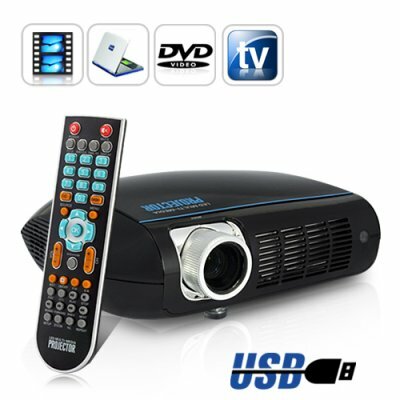 Successfully Added Multimedia LED Projector with Built-in DVD Player (USB, HDMI, VGA, AV, ATSC) to your Shopping Cart. Multimedia LED projector with built-in DVD player that plays DVDs, movies directly from the USB drive, or connect to any other video source - your all-in-one solution for enjoying movies and TV! Crisp Clear images: The LED light source delivers a wider color range and deeper color saturation than traditional lamps and provides clear, crisp images for any type of media from videos and TV. This LED projector will bring your movies to life in big screen splendor! True Multimedia All-in-one: Apart from playing DVDs or movies from a USB drive, this projector can also be connected to your computer, home video system, or receive TV with its built-in ATSC tuner. It’s compactly built and can be used in any number of settings such as offices, conference rooms, classrooms, living rooms, etc. No more worry about replacing lamps: The LED light source consumes less energy than traditional lamp-based projectors and is mercury free. It offers up to 50,000 hours lamp life, which means it can last for more than 30 years (4 hours a day). Additionally, because LEDs stay cool, you can turn off the projector and pack it up without having to wait for the lamp to cool down first. Apart from all these great features, when you consider that it’s offered at an amazing wholesale price, there’s not much left to consider. It’s now in stock for immediate shipment worldwide. Order a sample today and we will express ship it out to you tomorrow. Brought to you by your source of China factory direct electronics, Chinavasion. When used with a computer, please adjust the resolution of your computer to 800 x 600 or below before connecting to the computer. The product supports worldwide voltages (100 – 240 V, 50/60 HZ).